The Shining Scroll is dedicated to Christy Woster whose long-time contributions are immeasurable and whose friendship and generosity were boundless. The Shining Scroll periodical (est. 1992) features information about the life and work of Canadian author, L. M. Montgomery (1874-1942). It includes new research, recent publications, and events related to the author, Anne of Green Gables (and her many other books and writing), and locations. The Shining Scroll is published by Mary Beth Cavert, co-editor, and Carolyn Strom Collins, co-editor and founder of the L.M. Montgomery Literary Society, at least once a year. It takes its name from a ﻿poem ﻿Montgomery loved called The Fringed Gentian. The Scroll is highly respected by both Montgomery experts and casual fans. Please feel free share a link to this page and observe the copy rights of the authors and cite material appropriately. Contact the LMMLS for image and content permissions and questions. Please note that several issues are housed at the L.M. Montgomery Institute. A Bibliography of articles is being added HERE. These are PDF files and require Adobe Reader. If you are reading on an iPad, open in ﻿iBook﻿ to activate links in the articles. THE SHINING SCROLL 2018 Montgomery Christmas, Sandy Wagner, Honorable Marion Reid, Winnielee Clark Dunning, Jennie Macneill, Father Francis Bolger, Margaret MacQuarrie Dixon, Georgie Campbell Macleod, Roma Montgomery Campbell, Waldon Duggan, LM Montgomery and Reading Conference, Emily Woster, The Friends of the LM Montgomery Institute Auction Fundraiser, awards to Dr. Mary Rubio, Dr. Elizabeth Waterston, Jennie and John Macneill, Elizabeth Epperly, Bonnie Tulloch, Project Bookmark Canada, Lesley Clement, Linda Boutilier, Edward McDowell, Anne of Green Gables manuscript, Carolyn Collins, Anne's Face, Evelyn Nesbit, LM Montgomery's scrapbooks, Mary Beth Cavert, Irene Gammel, Rudolf Eickemeyer Jr., Carol Gerson, The LM Montgomery Reader, Imagining Anne: LM Montgomery's Island Scrapbooks, Christy Woster, Simon Lloyd, Historica Canada, Order of Canada, Journal of LM Montgomery Studies, Kate Scarth, The Blue Castle, Castles in Spain, Scotland, Alhambra, Dollar Glen, Castle Campbell, LM Montgomery and Nature, Summer in the Land of Anne, A Name for Herself, A World of Songs, Ben Lefebvre, Jen Rubio, Marilla of Green Gables, House of Dreams. THE SHINING SCROLL 2017 Anne's House of Dreams, Cape Tryon, Fragrance of Sweet-Grass, Magic Island, LM Montgomery Land Trust, Laura Pritchard Agnew, McClelland Goodchild & Stewart, FA Stokes, Collecting Montgomery signed books, Bertie McIntyre, Laura McIntyre Aylsworth, LM Montgomery and Reading Biennial Conference, Emily Woster, John Macneill, Jennie Macneill, Father FWP Bolger, Brenda Montgomery, Ruth Macdonald, David Macdonald, Jack and Linda Hutton, Bala, Luella Macdonald Veijalainen, Lucy Maud Montgomery Museum and Literary Arts Centre in Norval, Wynn Walters, Lt. Col. Samuel Sharpe, Lucy Maud Montgomery Society of Ontario, Canada 150, Elizabeth Epperly, Kate Macdonald, Ted Barris, Andrea MacKenzie, Ben Lefebvre, Melanie Fishbane, Lynda Leader, Rita Bode, Elizabeth Epperly, Leslie Clement, Jen Rubio, Rosalee Peppard, Jowi Taylor, Kate Scarth, Emily the Musical, Melanie Whitfield, Kathy Wasylenky, The Wreck of the Marco Polo, David Thompson, Earle Lockerby, Fox Point Montgomery House, Malpeque, Emily of New Moon, Blanche Fernandez, Rudy Petrella, Simon Lloyd, Poetry, At Rising Tide, Meet Me at Green Gables, LM Montgomery and Nature, Nora Lefurgey Campbell, Frede Campbell, George Macmillan, Pastor Felix Lockhart, Will Pritchard, Alec May Penzie MacNeill, Instead of a Boy Orphan Girl, Pierce and Rachael Macneill, Mary Beth Cavert, Carolyn Strom Collins. ​The Shining Scroll 2016 Christy Woster, LM Montgomery Literary Society Anniversary, Long Lost Short Stories, In the Home of Her Mother, I Dwell Among My People, LM Montgomery Kindred Spirits friendships, Mary Beth Cavert, book dedications, Laura Pritchard, Willy Pritchard, Ruth Macdonald, Leard House, LM Montgomery Society of Ontario, Leaskdale, LM Montgomery Heritage Society, Norval Ontario Manse Museum, Bala Museum, The Blue Castle, Dr. Philip Smith, LM Montgomery Institute, Prince Edward Island, LM Montgomery and Gender, Reading, Emily Woster, Kindredspaces, Clara A. Macirone, Vanessa Waltz, Maud a novel inspired by the life of LM Montgomery, Melanie Fishbane, An Annotated Bibliography of the Stories and Poems by LM Montgomery, Carolyn Strom Collins, After Many Years Twenty One Long Lost Stories by LM Montgomery, A Guide to LM Montgomery's Story and Poem Scrapbooks, A Home of Her Own, Leaskdale Manse Historic Site, LM Montgomery Complete Journals, Jen Rubio, The Watchman and Other Poems, Elizabeth Epperly, Chair in LM Montgomery Studies. The Shining Scroll 2015 Anne of Green Gables movies telefilm, Mary Beth Cavert, Kate Macdonald Butler, Breakthrough Entertainment, Mary Miles Minter, 1919 silent movies, Ben Lefebvre, Dawn O'Day, Dawn Paris, Anne Shirley, Megan Follows, Norman Campbell, Don Harron, Gracie Finley, Anne of Green Gables Musical, Sullivan Entertainment, Making Avonlea, Jack and Linda Hutton, Trudeau, Ella Ballentine, Christy Woster, Frances Marion, Wlliam Desmond Taylor, Realart Productions, Jack London, Ella Wheeler Wilcox, Mary Pickford, Fred Thomson, Silver King, World War I, Anne of the Island, Jonathan Crombie, Friends of the L.M. Montgomery Institute, Clara Macirone, L.M. Montgomery Heritage Museum, The Story Girl, Montgomery Inn at Ingleside, Cornelius Leard House, Herman Leard, Edwin Simpson, Bideford Parsonage, Carolyn Strom Collins, Sandy Wagner, Holland Map, Earle Lockerby, Douglas Sobey, LM Montgomery Birthplace, Linda Boutilier, Father Francis Bolger, George Campbell, Terry Kamikawa, Senator Donald Montgomery, Park Corner, Lake of Shining Waters, LM Montgomery Society of Ontario, Melanie Whitfield, Gwen Layton, Melanie Fishbane, Vanessa Brown, L.M. Montgomery's Rainbow Valleys, Rita Bode, Lesley Clement, Elizabeth Waterston, Margaret Steffler, Laura Robinson, Natalie Forest, Kate Sutherland, Jennie Rubio, Readying Rilla, Rock's Mill Press, Maud in the Garden, Kate Waterston, Donna Campbell, In Orchard Glen, A Sunny Subaltern, The Worn Doorstep, The Watchman and Other Poems, Emily Woster, Caroline Jones, The Looking Glass: New Perspectives on Children's Books, The L.M Montgomery Reader, 2016 PROSE Award, L.M Montgomery and Gender, LMMI, University of Prince Edward Island. The Shining Scroll 2014 part 1 LM Montgomery Institute, 11th biennial conference, University of Prince Edward Island, LM Montgomery and War, Benjamin Lefebvre, Andrea McKenzie, Elizabeth DeBlois, Mary Beth Cavert, If Our Women Fail In Courage, World War 1, Rilla of Ingleside, John McCrae, In Flanders Fields, Moina Michael, We Shall Keep Faith, Shall Our Men Be Fearless Still, Nora Lefurgey, Carl Montgomery, Goldwin Lapp, Maclaren Gordon, 2nd 3rd 4th Canadian division, CEF, 20th 27th 102nd 105th 116th battalion, Distinguished Conduct Medal, Vimy Ridge, Royal Flying Corps, RFC, Hundred Days Offensive, Rainbow Valley, Frede Campbell, Cameron McFarlane, PPCLI, Macdonald College, McGill University, Carolyn Strom Collins, short stories, poems, Rea Wilmshurst, Ephraim Weber, bibliography, keynote speakers, Jonathan Vance, Irene Gammel, Elizabeth Epperly, Mary Riter Hamilton, #lmmi14 papers, The Canadian Home front, This Anne Place, Confederation Centre, Jesse Inman, Maud of Leaskdale, Choir of Veteran Affairs Canada, Cavendish Home, postal stamp theft, Donor Collections, Kate Macdonald Butler, Donna Jane Campbell, Anderson Silber, Ryrie-Campbell, Lindsey MacCallum, Roberston Library, Prince Edward Island 1939, Fannie Jane Wise Mutch, RE Mutch, William MacCannell, George Campbell, John and Jennie Macneill, FWP Bolger, Mary Rubio, Park Corner, Cavendish, Birthplace, Lover's Lane, Anne Victoria Photography. The Shining Scroll 2013 LM Montgomery Institute 20th anniversary, Elizabeth Epperly, Simon Lloyd , Kate Macdonald Butler, Dr. Stuart Macdonald, Donna Campbell, Mammoth Cave, Jane Ledwell, Jean Mitchell, Anne Around the World, Friends of the LMM Institute, The Golden Road, Mary Lawson, Mary Beth Cavert, book dedication, the Yankee Gale, Sandy Wagner, Cavendish Home, Macneill Homestead, theft of postal cancellation stamp, Canadian National Historic Site, post office, Lewis Benjamin Woolner, North Rustico, PEI, Dalhousie University, Clara Woolner Macneill, Ella Banks Brown, needlework, samplers, cross-stitch, LM Montgomery's favorite books, Over Prairie Trails, The Heart of the Ancient Wood, The Child's House, Alice Munro, new books about LM Montgomery, Remembering Dr. Stuart Macdonald, Emily Woster, Barb Murphy, The Anne of Green Gables Musical Turns 50, Christy Woster, Gracie Finley, Don Harron, Norman and Elaine Campbell, Charlottetown Confederation Centre, the Barraclough House, Norval, Glen Williams, Deborah Quaile. The Shining Scroll 2011 December part 1 Leaskdale Manse Museum, Margaret Leask Mustard, Wilda and Harold Clark, Elsie Bushby Davidson, Monuments Board of Canada, Gerri Lynn O'Connor, National Historic Site, Carol Gaboury, Kathy Wasylenky, Nina Elliot, Lucy Maud Montgomery Society of Ontario, Parks Canada, Green Gables, Ernest and Myrtle Webb, Dr. F.W.P. Bolger, Heath and Mary Ella Montgomery, John and Jennie Macneill, George and Maureen Campbell, Bideford Parsonage, Wayne and Janice Trowsdale, Kathy Gastle, Elaine Crawford, Jack and Linda Hutton, Bala Museum, Mary Rubio, Elizabeth Waterston, Betsy Epperly, Yoshiko Akamatsu, Asa and Stefan Warnqvist, Joanne Wood, Melanie Whitfield, Ted Barris, Mary Beth Cavert, Rainbow Valley, Kate Sutherland, L.C. Page, Historic Leaskdale Church, Emily and Christy Woster, The Good Fairy, Allan McGillivray, Jason Nolan, Yuka Kajihara, Emily of New Moon, Rita Bode, Ben Lefebvre, The Blythes Are Quoted, Laura M. Robinson, Natalie Forest, Mammoth Cave, Fingal's Cave, Lesley Clement, Hypatia Club, Rilla of Ingleside, Greyfriar's Bobby, Melanie Fishbane, Donna Campbell, Maud of Leaskdale, Conrad, Boyce, Jennifer Carroll, Elgin Whitfield, Ewan Macdonald, Oliver Macneill, Frederica Campbell, Goldwin Lapp, Morley Shier, Robert Brooks, RFC, 116th Battalion CEF, 20th Battalion CEF, Mary Doria Russell. The Shining Scroll 2011 December part 2 Montgomery wedding, Kindred Spirits magazine, Anne of the Island,Halifax,, Nova Scotia, Sue Lange, Dalhousie, Ladies College, Lottie Shatford, Grace Lin, Barbara Esbensen, Anita Webb, Green Gables, Montgomery's death, Mary Beth Cavert, Anne's House of Dream collectible, Joanne Wood, poems, short stories, Montgomery bibliography, Christy Woster, Elizabeth Waterston, Order of Ontario, Yuko Izawa, Duke and Duchess of Cambridge. The Shining Scroll 2010 December part 1 Collecting and Sharing L.M. Montgomery, Mary Beth Cavert, Una of the Garden, Australian editions of LM Montgomery's works, Joanne Wood, Platypus, Bellbird, Cornstalk, Dorothy Wall, Sybil Tawse, Angus and Robertson. The Shining Scroll 2010 December part 2 ﻿L.M. Montgomery Conference, Montgomery and Nature, Elizabeth Waterston, Elizabeth Epperly, Ben Lefebvre, George Campbell, Jennie Macneill, Emily Woster, Asa Warnqvist, Gabriella Ahmansson, Christy Woster, Mary Beth Cavert, To A Desired Friend, A Bad Boy's Diary, Anne clothes, Laurapalooza, Emily Woster. The Shining Scroll 2010 December part 3 Four Winds Lighthouse, Anne's Houise of Dreams, Captain Jim, Cape Tryon, Carolyn Strom Collins, Melrose Cottage, Emily of New Moon house, Malpeque, The Marco Polo ship, Ruth E. Campbell, Georgie Campbell, Margaret Leask, Mary Beth Cavert, Booklet of Verse, Montgomery poetry book, Cohen Collection, Archives Canada, Carolyn Strom Collins, Montgomery bibliography. The Shining Scroll 2009 September part 1 Reviews of Anne of Avonlea, Christy Woster, Anne of Avonlea’s Miss Stacy: Book Dedication to Harriet Gordon Smith, Mary Beth Cavert, The Bideford Parsonage, Jack Hutton, Dr. Mollie Gillen, Mary Beth Cavert, Preview of The Blythes Are Quoted, More About Edith Russell, Musings on Autumn, Christina Wyss Eriksson, Collectors' Corner New Finds of Montgomery Material. The Shining Scroll 2009 December part 2 L.M. Montgomery and World War I: A Book Dedication to Goldwin D. Lapp, Montgomery's Other Soldiers, Mary Beth Cavert, The Untold Story of L.M. Montgomery's Japanese Kimono, Yuka Kajihara, International Anne: Happenings from Around the World, New Books, The Symbolism of Needlework and Textile Arts in the Anne Series, Pamela Hancock, Anne in Space, PEI Happenings, Carolyn Strom Collins, Simon Lloyd, Collecting LM Montgomery, Collectors' Corner, Christy Woster. Clippings and Cuttings. The Shining Scroll 2008 December part 2 L. M. Montgomery, Anne of Green Gables and the Idea of Classic Conference, Christy Woster, International Anne, Ann Johnson, A Note About Books, Mary Beth Cavert, New Edition of The Anne of Green Gables Treasury Published, Carolyn Strom Collins, The Nine Lives of L. M. Montgomery musical debuts on PEI, From Canada to the World The Cultural Influence of L.M. Montgomery Conference, First L.M. Montgomery Conference at University of Guelph, Deborah Quaile, L.M. Montgomery Literary Society Meetings and Anne 100 Events, A Writer Forgotten The Story Of Edith Russell, Rainbow Valley and L.M. Montgomery’s Book Dedications, Robert Brooks, 116th Battalion, C.E.F., The Open Fellowship of Kindred Spirits Impressions of Montgomery Scholarship, Vanessa Brown. The Shining Scroll 2007 L.M. Montgomery Literary Society Web Site Launched, The Artists of Anne of Green Gables, Christy Woster, WAJ CLaus, MA Claus, George Gibbs, Marilla’s Amethyst Brooch Unlocking the Secrets of Antique Jewelry, Sarah Riedel, Following In Anne’s Footsteps An Anne Itinerary For Prince Edward Island, Carolyn Strom Collins, LM Montgomery Ancestors Arrive, Books, exhibits, and The Nine Lives of LM Montgomery, Lest We Forget Rainbow Valley, Mary Beth Cavert, Leaskdale soldiers, Morley Shier. The Shining Scroll 2006 Summary of the 7th L.M. Montgomery Conference at the University of Prince Edward Island, Collecting L.M. Montgomery, Historic Recognition for the Macneill Homestead in Cavendish, Plagiarism or Deadly Parallel in Anne’s House of Dreams, Christy Woster. The Shining Scroll 2005 L.M. Montgomery and the Railway King of Canada. Christy Woster, The Ronald McNair Program Supports Montgomery Research, Emily Woster, Kilmeny of the Orchard and L.M. Montgomery’s Book Dedications, Bertie McIntyre, Mary Beth Cavert, The Marco Polo ship model, Anne and Gilbert musical, Carolyn Strom Collins. The Shining Scroll 2004 6th L.M. Montgomery Conference at the University of Prince Edward Island, The Readings of a Writer, Emily Woster, The Woolner Jug, A Tangled Web, Carolyn Strom Collins, Who Is Isabel Anderson, Mary Beth Cavert, What Happened to Nate Lockhart, On War and Writing L. M. Montgomery’s Thoughts on World War I and Her Advice on Authoring Books, Everywoman’s World, Toronto, April 1915. The Shining Scroll 2003 The Shifting Landscapes of LMM, Carolyn Strom Collins, Dr. Elizabeth Epperly's Address at the LMM Memorial Service, The Story Girl, Rilla of Ingleside and L.M. 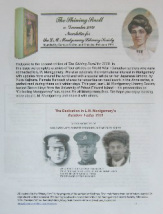 Montgomery’s Book Dedications, Frederica Campbell, Mary Beth Cavert, A Visit to the Guelph Archives, Elsie Davidson Montgomery’s maid, the Bala Museum, LMM Heritage Museum, The 2004 Symposium L.M. Montgomery Conference at the University of Prince Edward Island. The Shining Scroll 2002 5th International conference of the LM Montgomery Institute, Mary Beth Cavert, Official Launch of the Virtual Museum, George Maureen Campbell, Elizabeth Epperly, Ruth Macdonald, Dr. Bolger, John Jennie Macneill, Montgomery Homestead, Elizabeth Waterston, Mary Rubio, A Tangled Web, Anne of Ingleside, Carolyn Strom Collins, Picturing A Canadian Life, Janet Lunn, Irene Gammel, Christina Wyss Eriksson, Christy Woster, Penny Schreck, Anne Woolner, Lewis Woolner, Frederic Woolner, Sarah Reidel, 1919 Anne of Green Gables silent movie, Leaskdale Manse, Jim Gaboury, Carol Gaboury, Wilda Clark, Kathy David Wasylenky, Pat Millner, Elsie Davidson, Gerri Lynn O'Connor, Kelly Boehm, Janet Ecker, Kate Macdonald, Nina Elliot, St. Paul's Presbyterian Church, Gayle Clark, Mary Beth Cavert, Emily Climbs, Arthur John Lockhart, Pastor Felix, Henry Longfellow, Evangeline, Nate Lockhart, Winterport Maine. The Shining Scroll 2001 Wilda Harold Clark, Uxbridge, Elsie Davidson, Leaskdale Manse, Uxbridge-Scott Museum, Zephyr, Road to Avonlea, May Beth Cavert, Sarah Reidel, Bala Museum, Jack Linda Hutton, Mary Miles Minter, Megan Follows, Riverside Drive Toronto, Norval, Crawford Bakery, Aunt Maud's Recipe Book, Luella Macdonald Veijalainen, great grandson, Jennie Macneill, Carolyn Strom Collins, Alexandra Heilbron, Elizabeth MacLeod, Montgomery short stories. The Shining Scroll 2000 L.M. Montgomery and Popular Culture, Mary Beth Cavert, Stories Re-discovered, Carolyn Strom Collins, PEI Scrapbook serialization of Anne of Green Gables November 1909, Pat of Silver Bush Dedication, Alec May MacNeill, Secret Field, Anne of Green Gables the Continuing Story, Emily of New Moon musical, Anne animation, Bedeque Blueberry Social, Bideford Parsonage, Anne’s Tea Party, 125th anniversary of Montgomery’s birth, Kerlan Collection, University of Minnesota. The Shining Scroll 1999 Anniversary Memorial Donation, Jim Gaboury, Carol Gaboury, Leaskdale Manse Museum. Avonlea Village Cavendish, Carolyn Strom Collins, History of Stanley Bridge, L.M. Montgomery Ecumenical Memorial Service, Afternoon Tea at Dalvay by the Sea, LMM Land Trust, A Life Less Happy The Dilemma of Being Maud, Dr. Kevin McCabe, The Lucy Maud Montgomery Album, Ingleside Impressions. The Shining Scroll 1998 In Memoriam: Carol Gaboury, Mary Beth Cavert, Carolyn Strom Collins, Tribute to Wilda Clark, Bala Museum, Message in a Bottle The Literature of Small Islands, Conference at the University of Prince Edward Island, Thinks Modern Flapper Will Be Strict Mother, Montgomery essay, The Woolners, North Rustico, Anne Day Camp, Anne is not just for Girls. The Shining Scroll 1997 The Manse is Declared a Canadian Historical Site, Mary Beth Cavert, Fire at Green Gables, Carolyn Strom Collins, News from PEI, Bala Celebration, Mollie Gillen, Norval Dedication of Garden, Emily of New Moon Being Filmed, Finding LMM’s Blueberry Hill, Gog Magog Project, The Anne of Green Gables Christmas Treasury. The Shining Scroll 1996 L.M. Montgomery International Conference, Virginia Mold, Literary Societies, Carolyn Strom Collins, A Japanese Wedding At Silver Bush, In Memory of Rea Wilmshurst, Mary Beth Cavert, To The Friends of Anne, Fred Wright, Montgomery’s scrapbooks. The Shining Scroll 1995 Visit Maud Land, Prince Edward Island, Jaimie Lavanger, Ontario Travels, Mary Beth Cavert, Carolyn Strom Collins, Kindred Spirit Reading List, Betty Heath, Anne is Not Just for Girls, Lance Erickson Ghulum, Preview of 1996 Symposium, The Bala Museum, The Blue Castle, Muskoka Dream. The Shining Scroll 1994 L.M. Montgomery and Her Works: An International Symposium, Mary Beth Cavert, Keepsake Books, The Macneill Kitchen, Literary Society Member National Poetry Award, Barbara Esbensen, Magog. The Shining Scroll Special: In Ontario 1994 A special edition of a visit to Montgomery sites in Ontario. The Shining Scroll 1993 L.M. Montgomery Institute Opens, Carolyn Strom ​Collins, Celebration at Uxbridge, Ontario, Mary Beth Cavert, Summer Reading, Literary Society programs.